It's Halloween! Happy Halloween everyone! What's everyone up to? I'd like to thank Sandy from Sunday Fryed and Reem from Makeup For Lunch for the nominations! 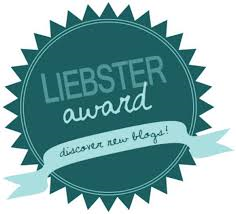 The Leibster Award is an award that helps to bring smaller bloggers together, and to increase the blogging community! 1. When and how did you come to the wonderful world of blogging? I started my blog at the beginning of summer this year, so I'm still pretty new! I decided to start a blog and I thought it would be a lot of fun and it would be a great step in the direction of my dream career, a magazine journalist. 2. When you were little, what did you dream of becoming when you grew up? When I was very little I wanted to be a dance choreographer as I took ballet, tap and jazz! As I'm still growing up (I'm 15 years old) I dream of becoming a magazine journalist or editor! 3. What does the word 'community' mean to you? My immediate thought is family. An environment full of supportive, friendly people that you can relate to. 4. If you could go anywhere in the world, where would be your first choice? It has to be between Ibiza or New York. Their fun iconic styles are amazing and I'd love to experience the exciting fun of Ibiza and the city chic of New York! Everyone who has achieved or are working towards their dreams or goals! 7. What's your favourite thing to do? Seeing my friends and family! I just enjoy spending time with them, it doesn't matter what we are doing. 9. If you could have any power, what would it be? I would love to be able to turn invisible! You could sneek around and do whatever you wanted, and meet whoever you wanted! 10. What was the first book you ever read? When I was little I loved the story 'I Love You, Blue Kangaroo' by Emma Chichester Clark. The main reason may be that the main protagonist was a young girl called Lily, but I loved the cuteness of the story! I still enjoy reading the book now to my little sister! 11. Where do you see your blog in 5 years? I hope to have a following that enjoys reading my blog posts. I have been thinking about starting YouTube videos, maybe in the future, who knows? 1. What's your favourite part of your face/body? I usually get compliments on my eyelashes as they are so long, and my hair as it is naturally highlighted. I enjoy it so much! I love being able to have my own platform where I can write, and I love the blogging community! 3. Do you have someone who keeps you going? Not really, my friends and family are really supportive though. 4. Where would you like to spend your next vacation? New York or Ibiza! What amazing fashion destinations! I will be 25. Hopefully I would have finished university and got to a steady job (hopefully magazine journalism!). I would have hoped to have travelled a lot aswell! 6. What's your favourite season? I think it has to be Spring! The weather starts to get warmer, the flowers start to bloom and there are some many cute baby animals! 7. Who's your biggest inspiration? Anyone who has achieved or who are working towards their dreams and goals! 8. What motivates you when you are feeling down? I can confide in my friends and they are sure to prick my spirits up. If not I resort to listening to music! 9. Do you take blogging seriously or just a hobby? I think blogging should be fun! I don't use my blog as a business or anything, or not yet anyway. 10. Would you follow your blog if weren't the writer? Yes! My blog is all about this I'm interested in. I like to be myself through my blog. 2. What's your favourite thing about blogging? 3. How would you describe yourself in three words? 4. Would you rather be an actress or singer? 6. What's your favourite flavour ice cream? 8. What's your favourite makeup brand and why? 9. What's your favourite high street store? 10. What's your favourite beauty or fashion tip? Good Luck and comment your responses below! Thanks again to Sandy and Reem for the nominations! As this award is all about introducing and meeting new bloggers, below is a new, amazing fashion blog, so make sure you check it out! Victoria gives out great outfit ideas and posts everything fashion!